Over 300,000 graduates have been sent letters from the Student Loans Company (SLC) purporting to be from a debt collection firm demanding payment. MoneySavingExpert.com has seen one example of this unacceptable behaviour, which was sent to us after we called for you to email us copies of any letters you've received from fake lawyers chasing debts – whether for energy firms, banks or payday lenders – after claims it may not just have been Wonga that has used these sneaky tactics. The letter from the SLC isn't from a non-existent lawyer, as was the case with Wonga – an issue which the City of London Police is now assessing whether to investigate (see the Wonga to pay £2.6m MSE News story) – but it uses similar tactics to scare people into repaying their debt. The SLC's letter purports to be from a debt recovery firm called "Smith Lawson & Company". But only at foot the of the letter does it say Smith Lawson & Company is just a trading name of the SLC, with which it shares its initials. When MoneySavingExpert.com checked today, Smith Lawson & Company wasn't listed on Companies House, and when we rang the number on the letter we ended up coming through to the SLC, so the firm appears to be non-existent. The issue was discussed in the House of Lords yesterday, while Business Secretary Vince Cable also quizzed the non-executive chair of SLC, Christian Brodie, about these letters, which have been sent to 309,000 graduates since 2005. Brodie apologised and said it would review these practices to ensure the same thing doesn't happen again. It adds that it has now stopped sending out these letters. When MoneySavingExpert.com pressed it to see if it would offer compensation in the same way as Wonga has, SLC said no, as "no charges were made for these letters and they were only issued to people who were in significant arrears (more than three months)". Here's a copy of a letter forum user Fermi was sent (click to open). This wasn't a letter sent to thousands as it was in response to a specific query, but the way the letter is designed highlights how it misleads customers into believing it's from an external debt collection agency. 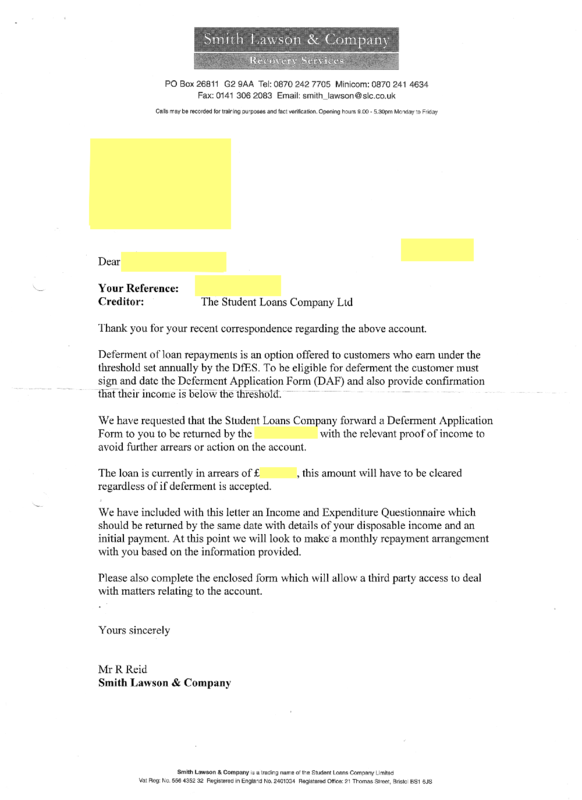 Fermi says: "The letters made me feel anxious and worried that my accounts had been passed on to a debt recovery agency before I realised some time later that Smith Lawson & Co was just the Student Loans Company playing games by using a rather deceptive letterhead. "This came at a time when I was not in a great place, either financially or emotionally, otherwise I would not have been in arrears in the first place. These letters simply made a bad situation worse." Wendy Alcock, campaigns manager at MoneySavingExpert.com, says: "Implying you're a debt collection agency when you're not is simply unacceptable. For years this letter will have caused unnecessary stress to people that may already be struggling with their finances. "No business or organisation should engage in this type of underhand activity – let alone a publicly-funded one." How do I check if a debt recovery firm is legitimate? If the debt recovery firm is actually just a trading name or part of the firm you owe the debt to, look for clues on the letter you receive. In the SLC's case, it was in the small print. If a company has done what the SLC has done by purporting to be a debt recovery firm, you should first complain to this company. In this example you need to complaint to the SLC either by calling 0845 073 8908, emailing: customer_complaints@slc.co.uk, or writing to: Customer Relations Unit, Student Loans Company, 100 Bothwell Street, Glasgow, G2 7JD. Be sure to include your customer reference number. The SLC has five working days to respond to you and it will provide a response within 15 working days. In the SLC's case, if you're unhappy with its response you can request for a senior manager to review the complaint. It then has 15 working days to respond. After this, if you're still unhappy with the response, you can take your complaint to your local MP, or if you're a pre-1998 mortgage-style loan graduate you can take your complaint to the Financial Ombudsman Service. If your complaint relates to a post-1998 loan, complaints need to be made to the Parliamentary and Health Service Ombudsman (England), the Public Services Ombudsman for Wales, The Scottish Public Services Ombudsman or The Northern Ireland Ombudsman. What does the SLC say? In a statement released this week the SLC says: "The Student Loans Company has a duty to collect every pound that is owed, for the taxpayer. The Smith Lawson collection process has been used since 2005 to support collection activities and was mainly used after the initial in-house collections process had been exhausted for customers who had persistently defaulted on their loan repayments and were in arrears for a minimum of three months. "The Student Loans Company has suspended all use of Smith Lawson-branded correspondence. The Company had reviewed its Smith Lawson letters following discussions with the Office for Fair Trading in March 2014 and had agreed to implement their suggested changes. The issuing of any revised Smith Lawson correspondence has still to be agreed." If you believe you've had a letter from a fake lawyer or law firm, or from a fake debt recovery firm, first check to see if it's legitimate – see our Send us your debt demands from fake lawyers MSE News story for how to do this. We won't publish any of your personal information and we'll keep all of your details confidential. However if you're uncomfortable about emailing in copies of letters with your personal details on, you can blank out any personal information before sending the copies to us. Additional reporting by Aileen Lees.